Why do I need to see for myself? I own Battlefield 4, I've played it. I don't need to know someone elses opinion of it to have my own decision made. Yes, but don't miss the bigger point. He has been classified as a "fan boy" for DICE, or a puppet who says all the right things in order to continue to be invited to E3, receive goodies in the mail, special dog tags, etc.. and yet here he is saying BF 4 is the best Infantry Game. Also, this point is not missed on me: DICE Stockholm may have started BF 4, but DICE LA had to come in and "fix it" because people were very upset at the state of the launch. One might argue: "Well, then BF V will also be good in a year or so. ", and it remains to be seen--the difference is, I don't see DICE LA coming to the rescue, but who knows? Also notice, he didn't simply revert back one title to BF 1, nay, he went back 2 (or 3 if you count BF Hardline, which I don't). Suddenly they (DICE) have shown a desire to cave to the "latest trend" which is Battle Royale. This is a troubling development since the BF we all know and love (Large Conquest) seems to have taken, not just a back seat, but is now in the third row seating. 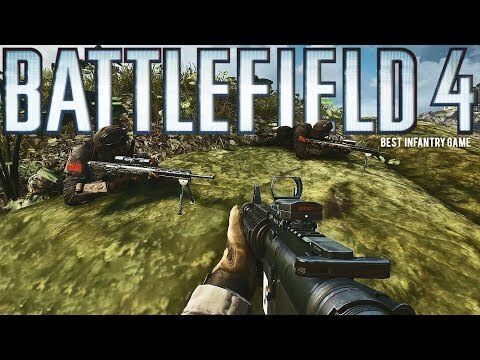 tl;dr: BF 4 is the best infantry game. Also for @Braddock512 to view the video and take notice, in case it slipped his attention. BF4 will be the best battlefield made by EA so far. This is great advice which goes for almost anything in life also. They totally lost what made battlefield great.